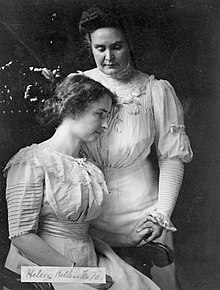 This article is about the teacher and companion of Helen Keller. For other uses, see Anne Sullivan (disambiguation). Feeding Hills, Agawam, Massachusetts, U.S.
Forest Hills, Queens, New York City, New York, U.S.
Johanna Mansfield Sullivan Macy (April 15, 1866 – October 20, 1936), better known as Anne Sullivan, was an American teacher best known for being the instructor and lifelong companion of Helen Keller. At the age of five, Sullivan contracted trachoma, an eye disease, which left her blind and without reading or writing skills. She received her education as a student of the Perkins School for the Blind, where upon graduation she became a teacher to Keller when she was 20. Sullivan was born on April 14, 1866, in Feeding Hills, Agawam, Massachusetts. According to her baptismal certificate, her name at birth was Johanna Mansfield Sullivan; however, she was called Anne or Annie from birth. She was the oldest child of Thomas and Alice (Cloesy) Sullivan. Her family emigrated to the United States from Ireland during the Great Famine. When she was only five years old she contracted a bacterial eye disease known as trachoma, which created painful infections and over time made her nearly blind. When she was eight, her mother died, and her father abandoned the children two years later for fear he could not raise them on his own. She and her younger brother, James ("Jimmie"), were sent to an overcrowded almshouse in Tewksbury, Massachusetts (today part of Tewksbury Hospital). Jimmie had a weak hip condition and died two to three months into their stay. Sullivan remained at the Tewksbury house for four years after his death, where she had eye operations that offered some short-term relief for her eye pain but ultimately proved ineffective. Sullivan lost her sight at a young age and therefore had no skills in reading, writing, or sewing, and the only work she could find was as a housemaid; however, she was unsuccessful at this position. Another blind resident staying at the Tewksbury almshouse told her of schools for the blind. During an 1880 inspection of the almshouse, she persuaded inspector Franklin Benjamin Sanborn to allow her to leave and enroll in the Perkins School for the Blind in Boston,[self-published source] where she began her studies on October 7, 1880. Although her rough manners made her first years at Perkins humiliating for her, she managed to connect with a few teachers and made progress with her learning. While there, she befriended and learned the manual alphabet from Laura Bridgman, a graduate of Perkins and the first blind and deaf person to be educated there. Also while there, she had a series of eye operations that significantly improved her vision. In June 1886, she graduated at age 20 as the valedictorian of her class. She stated, "Fellow-graduates: duty bids us go forth into active life. Let us go cheerfully, hopefully, and earnestly, and set ourselves to find our especial part. When we have found it, willingly and faithfully perform it; for every obstacle we overcome, every success we achieve tends to bring man closer to God and make life more as He would have it." The summer following Sullivan's graduation, the director of the Perkins Institution, Michael Anagnos, was contacted by Arthur Keller, who was in search of a teacher for his seven-year-old blind and deaf daughter, Helen. Anagnos immediately recommended Sullivan for this position and she began her work on March 3, 1887, at the Kellers' home in Tuscumbia, Alabama. As soon as she arrived there, she argued with Helen's parents about the Civil War and over the fact that they used to own slaves. However, she also quickly connected with Helen. It was the beginning of a 49-year relationship: Sullivan evolved from teacher to governess and finally to companion and friend. Sullivan's curriculum involved a strict schedule with constant introduction of new vocabulary words; however, Sullivan quickly changed her teachings after seeing they did not suit Keller. Instead, she began to teach her vocabulary based on her own interests, by spelling each word out into Keller's palm; within six months this method proved to be working, as Keller had learned 575 words, some multiplication tables, and the Braille system. Sullivan strongly encouraged Helen's parents to send her to the Perkins School, where she could have an appropriate education. Once they agreed to this, Sullivan took Keller to Boston in 1888 and stayed with her there. Sullivan continued to teach her bright protégée, who soon became famous for her remarkable progress. With the help of Anagnos, Keller became a public symbol for the school, helping to increase its funding and donations and making it the most famous and sought-after school for the blind in the country. However, an accusation of plagiarism against Keller greatly upset Sullivan: She left and never returned, but did remain influential to the school. Sullivan remained a close companion to Keller and continued to assist in her education, which ultimately included a degree from Radcliffe College. On May 3, 1905, Sullivan married Harvard University instructor and literary critic John Albert Macy (1877–1932), who had helped Keller with her publications. He moved in with them, and they lived together. However, within a few years, the marriage began to disintegrate. By 1914 they separated, though he is listed as living as a "lodger" with them in the 1920 U.S. Census. They never officially divorced. As the years progressed after their separation, he appears to have faded from her life. She never remarried. In 1932 Keller and Sullivan were each awarded honorary fellowships from the Educational Institute of Scotland. They also were awarded honorary degrees from Temple University. In 1955 Keller was awarded an honorary degree from Harvard University, and in 1956 the director's cottage at the Perkins School was named the Keller-Macy Cottage. In 2003, Sullivan was inducted into the National Women's Hall of Fame. Sullivan had been seriously visually impaired for almost all of her life, but by 1935 she was completely blind in both eyes. On October 15, 1936, she had a coronary thrombosis, fell into a coma, and died five days later on October 20 at age 70, in Forest Hills, Queens, New York, with Keller holding her hand. Keller described Sullivan's last month as being very agitated, but during the last week she was said to return to her normal generous self. Sullivan was cremated and her ashes were interred in a memorial at the National Cathedral in Washington, D.C. She was the first woman to be recognized for her achievements in this way. When Keller died in 1968, her ashes were placed next to those of Sullivan. Sullivan is the main character in The Miracle Worker by William Gibson, originally produced for television in 1957, wherein she was portrayed by Teresa Wright. The Miracle Worker then moved to Broadway and was later produced as a 1962 feature film. Both the play and the film featured Anne Bancroft as Sullivan. Patty Duke, who played Keller on Broadway and in the 1962 film version, later played Sullivan in a 1979 television remake. Roma Downey portrayed her in the TV movie Monday After the Miracle (1998). Alison Elliott portrayed her in a 2000 television movie. Alison Pill played her on Broadway in the short-lived 2010 revival with Abigail Breslin as Keller. ^ Clark, Tom Foran, The Significance of Being Frank: The Life and Times of Franklin Benjamin Sanborn, Xlibris, 2015, p. 177. ^ The life of Helen Keller Archived December 31, 2012, at the Wayback Machine, Royal National Institute of Blind People, last updated August 14, 2012. Retrieved December 30, 2012. ^ "Teaching Helen - Anne as Teacher (1886-1904)". www.afb.org. Retrieved 2019-02-27. ^ Wallace, Arminta. 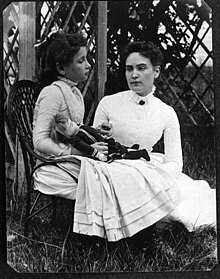 "Anne Sullivan, the Irish-American who taught Helen Keller to speak". The Irish Times. Retrieved 2019-02-27. ^ In the 1920 census, Keller was 38 years old and listed as head of her household in Queens, New York. Sullivan, age 52, is listed as living with her as a private teacher. John, age 44, is also listed as living with them, as a "lodger", with the occupation of writer/author. ^ Wilson, Scott. Resting Places: The Burial Sites of More Than 14,000 Famous Persons, 3rd ed. : 2 (Kindle Locations 24972–24974). McFarland & Company, Inc., Publishers. Kindle edition. McGinnity, B. L., J. Seymour-Ford, and K. J. Andries. "Anne Sullivan". Perkins School for the Blind. February 14, 2014. Accessed February 14, 2014. http://www.perkins.org/vision-loss/helen-keller/sullivan.html. Lash, Joseph (1980). 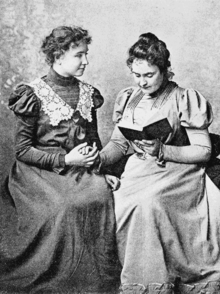 Helen and teacher: the story of Helen Keller and Anne Sullivan Macy. New York: Delacorte Press. ISBN 9780440036548. "Anne Sullivan". Educator. Find a Grave. January 1, 2001. Retrieved August 18, 2011.